Before you get started learning about R algorithm development, make sure you go through our Getting Started Guide to learn how to create your first algorithm, understand permissions available, versioning, using the CLI, and more. The full R language and standard library version 3.3.1 is available for you to use in your algorithms. Furthermore, algorithms can call other algorithms and manage data on the Algorithmia platform via the Algorithmia R language Client. The main thing to note about the algorithm is that it’s wrapped in the algorithm() function. The algorithm() function defines the input point of the algorithm. We use the algorithm() function in order to make different algorithms standardized. This makes them easily chained and helps authors think about designing their algorithms in a way that makes them easy to leverage and predictable for end users. Then follow the instructions for how to work with data using the Data Api in the R Client Docs in order to upload your saved model to Algorithmia hosted data or you can store it in Dropbox or an S3 bucket. To find out more about working with data check out the Data Portal. Now that you have created your algorithm, you can add dependencies. Algorithmia supports adding 3rd party dependencies via the CRAN (Comprehensive R Archive Network) dependency file. Similar to how you would install through dev.tools() in R.
The last format will take longer to load the dependencies than the other formats, so it’s best to use it as a last resort. Note, that if you do add dependencies, you will still need to import those packages via library() to your algorithm file as you would do for any R script. 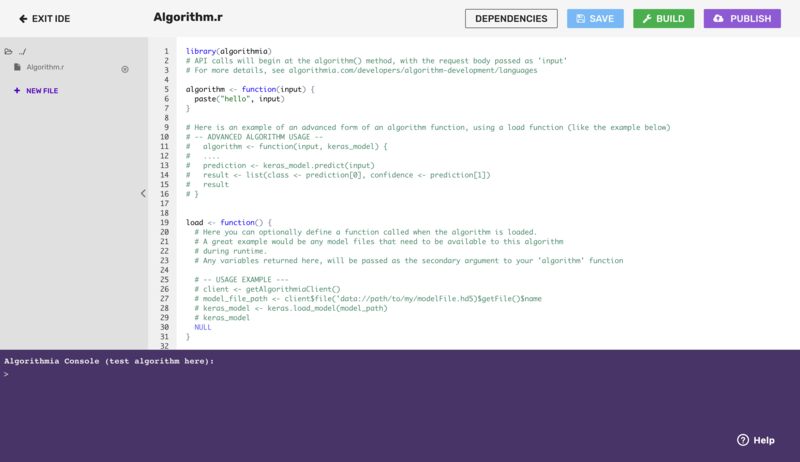 The Algorithmia dependency is already installed for your convenience and relies on R version 3.3.1. 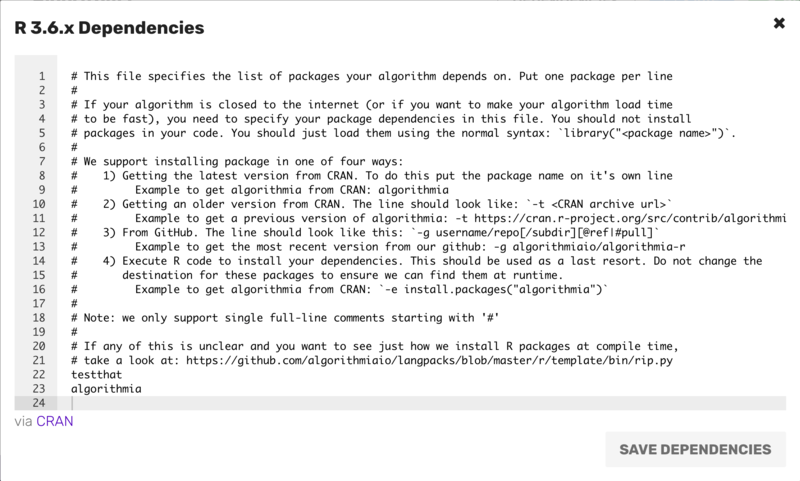 For more information about Algorithmia’s R package visit: Algorithmia’s CRAN package documentation. There are a few packages that require a little something extra in the dependencies file to work on Algorithmia. The first algorithm that we’ll create will take a JSON formatted object passed as input by the user which is deserialized into a R list before the algorithm is called. # Finds the minimum and maximum numbers. Go ahead and type or paste the code sample above in the Algorithmia code editor after removing the “Hello World” boilerplate code. # Get the contents of the file as a string. # Split up each sentence into words. The code above with return both the original text and the sentence split up into words. Note that we use the rjson package to parse JSON within your algorithm. 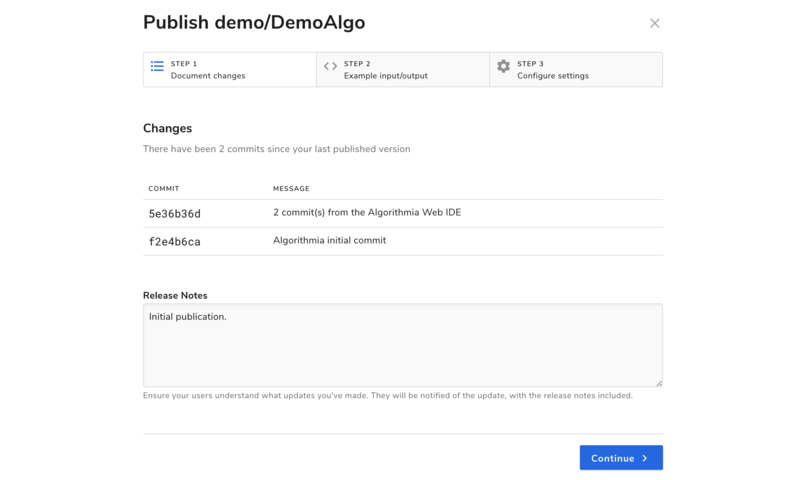 To call other algorithms or manage data from your algorithm, use the Algorithmia R Client which is automatically available to any algorithm you create on the Algorithmia platform. For more detailed information on how to work with data see the Data API docs. # Call algorithm that returns main text content from a URL. # Take user input of URL and return text as words. As you can see from these examples, fields that are passed into your algorithm by the user such as scalar values and sequences such as lists, dictionaries, tuples and bytearrays (binary byte sequence such as an image file) can be handled as you would any Python data structure within your algorithm.